And though the house had witnessed many strange scenes, wolf hunts and wine drinking and weddings and wars, it is doubtful whether during its whole history any of its inmates had had such adventures as those of Sylvia and Bonnie Green. Joan Aiken is a true storyteller–a spinner of tales that in another age would keep a crowd spellbound around a dying fire, or make restless children eager for bedtime. Today, of course, she writes books: over a hundred of them to date. Whether she is writing a nursery tale for the youngest listeners or a thriller for adults, her books are based on the good, old-fashioned principle of the primacy of plot–and are saved from being mere potboilers by her quirky imagination and sure command of language. Many of her novels are tongue-in-cheek homages to the nineteenth century, that great age of plot-driven narrative, of Jane Eyre, The Moonstone, and Nicholas Nickleby. The Wolves of Willoughby Chase (first published in 1962) plunders all of these and more in its chronicling of the adventures of Sylvia and Bonnie, two children left at the mercy of a wicked governess. None of the classic ingredients are left out: the wicked governess and her unsavory accomplices, faithful old servants, a resourceful gooseherd, a vast mansion riddled with secret passages, shipwrecks and rescues, ravening wolves, penitential orphanages, near-fatal illnesses, a penniless maiden aunt and a bluff family lawyer. From the ominous snowbound opening in which men huddle together “for fear of the wolves,” to the closing lines quoted above, there’s never a dull moment. There’s not a scrap of subtlety, either, but it’s all great fun. If you missed Aiken as a child yourself, find one to read aloud to, and stop each session on a cliffhanger. There’s no other time in life when “What happens next?” is such a seriously important question. This is the first of a long-running children’s series. Later volumes abandon the adventurous but somewhat bland Sylvia and Bonnie to mainly follow the escapades of Dido Twite, a more idiosyncratic urchin introduced in the second book, Black Hearts in Battersea. Subsequent volumes play with the idea that an alternate world exists in which Britain’s Hanoverian line of monarchs never came to the throne. The current monarchy would thus be reduced to the status of Pretenders–how’s that for a fantasy? Aiken’s works also include dozens of short stories, which have been collected into several volumes including A Necklace of Raindrops, originally published in 1968 and reissued n 2001 with fine new line drawings by Kevin Hawkes. An age range is not indicated, but I would say these eight tales would be most enjoyed by a younger audience. Again, they beg to be read aloud; often cumulative and repetitive, they invite young listeners to anticipate the next episode. Aiken obligingly includes refrains suitable for chanting along, such as this extremely silly one from “The Elves in the Shelves”: “Elves in the shelves, mermaids in the bathtub, penguins in the icebox, rabbits in the coal bin, peacocks on the table, and seals in the sink.” There’s much delight in wordplay and humorous reversals, as in “The Pie in the Sky,” in which an old woman mistakenly rolls some sky into her piecrust and is carried away by the floating pastry. Taking a ridiculous idea to its extreme sometimes raises unexpected questions, as with “The Three Travelers,” in which an abandoned rail station becomes the departure point for three unlikely adventurers. Aiken can also write beautifully in a more poetic vein, as with the title story. When the North Wind becomes trapped in a tree, he rewards the man who rescues him with a wonderful necklace for his little daughter, which each year gives her a new magical power, but is coveted by a jealous schoolmate. Aiken is a master of the modern fairy tale, writing with clear knowledge and command of traditional elements while incorporating a contemporary idiom. Look for more of her story collections, such as Smoke from Cromwell’s Time or A Harp of Fishbones, to further experience the full range of her fertile imagination. For anyone who feels the pull of the lure of Story, Joan Aiken has much to offer. Aiken is marvellous, wonderful, awesome, the epitome of any positive superlative one can imagine. While I've read a lot of her work I'm so excited that there's still lots more to go, putting to one side all the pieces I still want to reread. I'd forgotten most of the plots in Necklace it's been so long since I read it, so that's definitely one for a revisit! When I was a child, I always started my library visits at the first shelf: Alcott, Alexander, and Aiken were all there. Anything I hadn’t read yet–or any favorite that called out to be revisited–would be my first pick. Aiken, like Roald Dahl, was a bit of a surprise when i found the adult books she’d written! 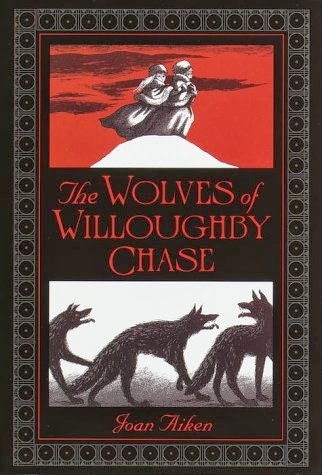 Wolves of WIlloughby Chase will always be a sentimental favorite of mine, with that awesome red and black cover. So glad to see another fan! The A shelf does have a lot of great authors. 🙂 I just did a reread of the first five “Wolves” books, so I hope you’ll be back for my review in a week or so.